Slice the rolls in half lengthwise. If they’re not fresh, toast them slightly for a few minutes. On one side, spread a tablespoon of refried beans; on the other, mash 1/4 of an avocado with a fork. Top the bottom half of the bread with a few slices of cheese, 2 or 3 slices of ham or cold cuts of your choice, it may also be shredded chicken or meat, and a couple of slices of tomato. 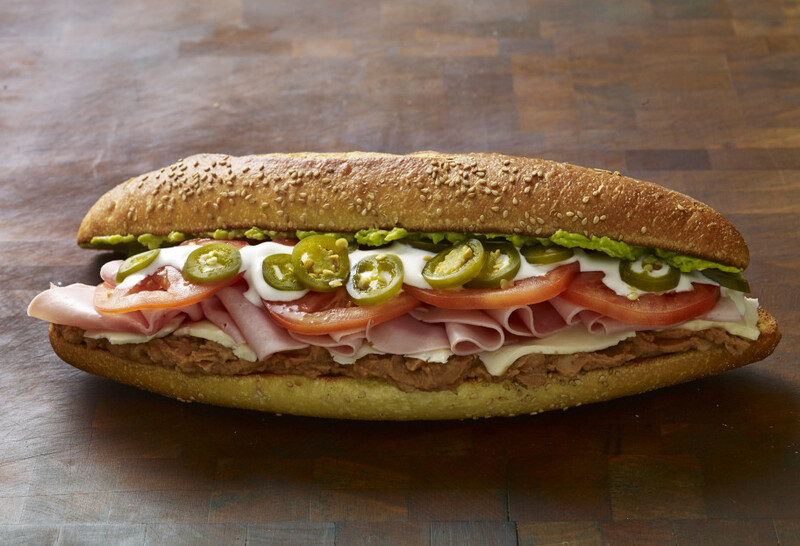 Drizzle a tablespoon of Mexican-style cream and crown your package with as many pickled jalapeños as you wish. Sprinkle a bit of salt on top. Place the top half of the roll on the sandwich and slice the torta horizontally. Eat it or wrap it up so that it can travel along with you. Hey Patty I enjoyed your show on create. I have a question I’m wondering if maybe you’d willing to address. That’s talking about Gringos eating Street Food in Mexico. there’s always a concern about Montezuma’s Revenge. Are there any rules of thumb that you live by to avoid it. My understanding has always been that you’re okay if you see the street food cooked in front of you but you think that’s true. Thank you. Hola Gary! My family and I eat street food in Mexico, all the time. The only thing that we try to avoid when eating on the street is ice with our drinks.